Dynamic Plastics was founded in 1993 as a modest two man operation that designed and built proto-type and production plastic injection molds. 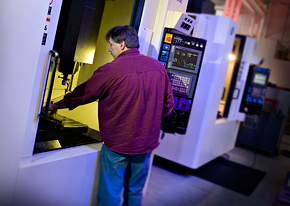 Over the years we have expanded to become a full service provider of tooling and injection molding solutions, complimented by our ability to provide or manage a variety of value added services. Our ability to meet all of your needs under one roof in a timely and cost efficient manner is what sets us apart from our competitors and is what gives you the "Dynamic Advantage." From the beginning, it has been our company's goal to provide our customers with reliable, high quality services delivered on time and within budget. As we have grown through the years and the services that we offer have expanded, we have kept this goal in mind and remain committed to honoring the trust that our customers place in us. It is and always will be our number one priority to provide you with the best possible service at a cost that fits within your budget.